Jessica Alba wasn't at the SAG Awards at the weekend but she was definitely awards-worthy in her black Elie Saab Couture gown at the 24th Annual Producers Guild Awards held in Beverly Hills. Jessica wore the look with pink lips and elegant bejeweled earrings. Although she stuck to one of her usual classic shades (this time black rather than white), there was something fresh about Anne Hathaway's SAG Awards look. Winning the Outstanding Performance by an Actress in a Supporting Role award she looked fab in her Giambattista Valli frock and swept-back hairdo. Another fine touch (along with the black Edie Parker clutch, jewels, and Jimmy Choo heels) was her amazing butterfly-touch manicure. 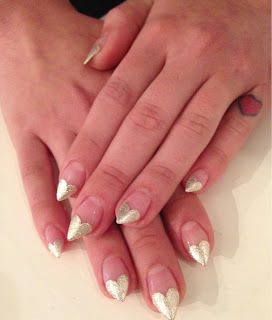 Anne had her nail look created by manicurist Tom Bachick (who also did Jennifer Lopez's Golden Globe Awards nail look). He added butterfly accents to the middle and ring fingers. And, although you can barely see it, he gave her a pedi with L'Oréal Paris Colour Riche Nail in Sparklicious – a glittery topcoat – over gold polish. Ms. Kidman was minus her usual red carpet company Mr. Urban as she attended the SAG Awards last night (January 27). Up for two SAG awards (Outstanding Performance by an Actress in a Supporting Role, and Outstanding Performance by an Actress in a TV Movie or Series) a lot was a stake for Nicole, and although she didn't win either, she was still a style winner in her sapphire blue Vivienne Westwood Couture column dress. With the gem of a dress, Nicole kept her hair simply straight and center-parted, and wore Fred Leighton jewels. Lea Michele, up for Best Cast Ensemble In a comedy series for Glee, was a the SAG Awards with co-star and real-life beau Cory Monteith at the.L.A. event last night (January 27). Lea was beautiful in her hot pink Valentino dress plus new ombre-look locks. Get a similar look to Lea with the Jill Stuart Pink Strapless Maxi Dress which is $298 at lordandtaylor. Nominated for Outstanding performance by a female actor in a leading role, Naomi Watts was pretty at the SAG Awards on January 27, in her pale Marchesa gown. Naomi teamed the strapless gown with side-swept curls and elegant Faberge earrings for a classic old-style look. Her silver clutch was by Salvatore Ferragamo, but you can get a similar look for less with the Damara Silver Crystal Box Clutch Bag. With her Liz Lemon outfits back in the costume department, Tina Fey was all glammed up for the SAG Awards on January 27. Tina was flashbulb-ready in her black Oscar de la Renta gown and Fred Leighton jewels as she showed off her Outstanding Performance by a Female Actor in a Comedy Series award. Completing her look with the curled hair-do and silver Oscar de la Renta clutch bag. Nina Dobrev cut a sleek and sultry figure on the SAG red carpet in her hor pink Elie Saab design. Nina teamed the column-dress with Judith Leiber clutch bag, Jimmy Choo heels, Neil Lane jewels and a glam up-do that managed to look low-maintience yet awards-worthy at the same time. Along with her subtle make-up, Nina's look was red carpet perfection! Michelle Keegan was gorgeous on the red carpet at the National Television Awards held at London's 02 Arena on January 23. Michelle wore a silvery snakeskin print halter gown which was an Ariella Couture design. Miranda Lambert was looking a little out of season but still fab in a summery yellow floral print dress for the PEDIGREE Feeding Project in Glendale, CA, on January 22. Miranda teamed the yellow Shoshanna shirt-dress with a blue Candy necklace and pink Brian Atwood heels. The Shoshanna "Teagan" dress costs $340.00 at Revolve Clothing. Jessica Alba wrapped up against the Paris slush in a sleek coat and Christian Dior accessories as she headed to the Christian Dior Haute Couture Show during Paris HC Fashion Week. Jessica was in almost all-black, barring the half grey shoe-boots and looked fab in her velvety coat. Get a similar look with the $119 Black Velvet Pleated Coat from Nordstrom. Attending the Golden Globe Awards After Party, Jennifer Lopez switched from white to black. And while her black Zuhair Murad dress was simple yet stunning, what was going on with her hands and wrists was anything but! Ms. J.Lo wore a load of statement rings and bracelets and if those weren't enough, some incredible nails too. Jennifer had her nails painted by Tom Bachik. As a L'Oreal spokesperson she had hair and make-up created with L'Oreal products so it's likely her nail polish was L'Oreal too. Get the look with L'Oreal Colour Riche Nail Polish in the shade "Walk On The Beach". Selena Gomez went with gold for the Golden Globe Awards night last week in a Las Vegas style glitzy Versace mini dress. Selena wore the Versace number with Jimmy Choo heels and some matchy gold earrings. Get a similar look to Selena with the $118.99 Gold Deco Strapless Dress from Arden B. What do stars like Lauren Conrad, Tyra Banks, and Kim Kardashian do when they have a bad hair day or breakout? Why, Tweet and Instagram it for all of their followers to see, of course. Check out these revealing celeb beauty tweets, plus more at DailyGlow! She's not even in the movies but Miranda Kerr had one of the most show-stopping looks of the 70th Annual Golden Globe Awards events. Attending the InStyle and Warner Brothers Party, Miranda was stunning in her red Zuhair Murad dress which slit at the front and at the leg. She wore her hair down in VS-style curls and showcased amazing bejewelled earrings. She accessorized with gold accessories. Winning look of the 70th Annual Golden Globe Awards (and she had a LOT of competition) was Taylor Swift. Attending the event held at the Beverly Hilton Hotel, Taylor made us swoon in her dark Donna Karan Atelier gown plus those amazing Lorraine Schwartz jewels. Kaley Cuoco is a bit of a risk taker - she proved that at the People's Choice Awards - and that's why we love her on the red carpet! Attending the Golden Globe Awards, Kaley teamed her sheer-topped Zuhair Murad gown with vampy plum lips. Make-up artist Jamie Greenberg used Mark Make it Rich Lip Crayon, in Royale, to achieve the look. Matching nails and a dress complimenting gold clutch bag completed her look. Taking care of her E! Fashion duties, Kelly Osbourne was on the red carpet at the 70th Annual Golden Globe Awards. Kelly was fab in her sweetheart-neckline Zac Posen gown featuring fab fishtail. At the after party it was another lilac-themed look, Kelly in a lace-overlay look that matched her lavender hair. As always with Kelly, she never lets down on the little touches and had amazing gold tipped nails! Check them out in her Twitter pic.